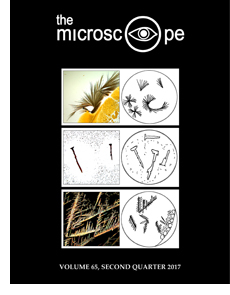 Excerpt: Twenty-five years ago, Walter C. McCrone, founder of McCrone Research Institute and previous editor of The Microscope journal, published a paper titled ‘Microcrystal Tests and the ‘Frye Rule’‘ (The Microscope, 40:3, pp 193 – 198, 1992). His paper anticipated a challenge to the continued use of microcrystal tests and emphasized their importance in the forensic science community. For those of you who are unfamiliar with this rule — which originated from the case Frye v. United States, 293 F. 1013, 1014 (D.C. Cir. 1923) — it states that methods used to support a court appearance must be technically sound as recognized generally in the forensic science community. Dr. McCrone predicted that microcrystal tests, although used for more than a century, were generally regarded as subjective. His solution to any potential Frye Rule challenge was through better microscopical and crystallographic characterization of the resulting precipitates and proper training to become proficient in testing methods. Excerpt: ‘We had an outbreak,’ said the catering manager, ‘so when guests collect a bread roll in the future, they will have to use tongs.’ And so he condemned hundreds of healthy people to risk infection that might previously have been confined to just one person, or two at most. We are living in an age of new hazards to health, yet society is not keeping up with the trends. We use yesterday’s methods to address tomorrow’s problems. New infections are waiting to pounce; people aren’t prepared, and nobody seems to mind. The use of tongs is a typical example. The rationale is clear. If you handle food while you’re infected, there is always the risk of passing on the germs to somebody else. But leaving tongs lying around for everybody to use does not prevent outbreaks — it causes them. Tongs are a dangerous source of cross-infection. The article, ‘The Discrimination of Pencil Marks on Paper in Forensic Investigations,’ published in The Microscope, Volume 65, First Quarter 2017, has the wrong image of the ‘completed and ready Duro-Tak ball’ for Figure 2 on page 14. The correct Figure 2 image is included below with related images. The Microscope regrets the error.